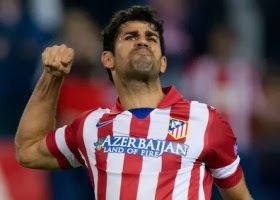 Chelsea are moving to beat Arsenal to the signature of Atletico Madrid striker Diego Costa. The Mirror claims that Costa, who was subject of a £20m bid from Liverpool during the summer, is considered by Chelsea as a less expensive alternative to AS Monaco star Radamel Falcao and has impressed Mourinho with a number of commanding performances in the Champions League for Atletico. Arsenal have been running the rule over Costa, 25, in recent weeks and reports suggest the club sent chief scout Steve Rowley to Spain to watch the Brazilian ace in action during Atletico’s Copa Del Rey match against Sant Andreu. But according to reports in Italy, Chelsea will attempt to bring Costa to England in the new year and are hopeful of securing a deal by offering Romelu Lukaku in exchange.